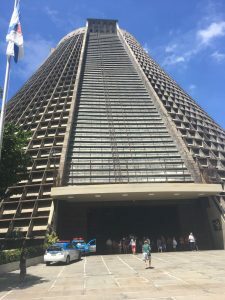 While on the face of it, a visit to Brazil may seem an impractical choice for travel on a time budget, as part of a short trip to South America, that’s what this was for me. 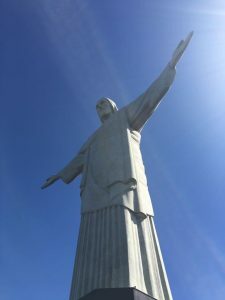 I’d wanted to go for a long time, but didn’t have the time for an extensive, multi-week trip around the continent, so opted for a four-night stay in Rio de Janeiro, part of a nine-night trip that also included Buenos Aires and Montevideo. We arrived after an early morning flight from Montevideo and were shattered. 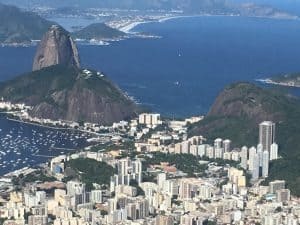 However, when we were dropped at our hotel overlooking Copacabana beach, all our tiredness evaporated as the wow factor of this buzzing and vibrant city took over. 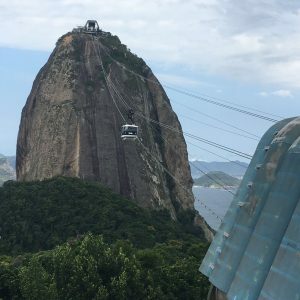 The list of things to do in Rio are endless and can cater for every taste; however, my lasting memory will without doubt be our trip up Sugar Loaf Mountain. It’s one of the must-dos in Rio, partly because of the experience itself and partly because of the views you get when you’ve arrived at the summit. I have to admit that while this was on my list, my research prior to going made me shudder at the thought. At just shy of 1,300 feet (and not being a fan of heights), and involving a trip on two cable cars each way, it fell into the category of things “I-really-should-do-but really-don’t-want-to-do”. I therefore procrastinated for the three days of our trip, convincing myself that I wouldn’t be missing out if I didn’t go (after all, there’s so many other things to do in Rio), before finally taking a deep breath and catching a taxi to the base terminal on the day we were due to fly home. My nerves didn’t abate even when we queuing for the car, but I really needn’t have worried. The cars are large and sturdy and the ascent only lasts for six minutes in total. The fact that each car can hold up to 65 people and they run every 20 minutes means than millions of people safely take this trip every year. The trip is divided into two parts: the first three minute ascent takes you up to Morra da Urca (Urca Hill) before going on further to the mountain. After the first leg, you get off and there’s a surprisingly large panoramic terrace here where you can walk around and take in the stunning views of Guanabara bay: the tiny islands dotted around in the bay, the beaches below, and on one side you can see the Christ the Redeemer statue majestically keeping watch over the city from the top of the Corcavado Mountain. At this point you’re so high that even the high-rise buildings of central Rio look small and insignificant in comparison to the natural beauty surrounding it. There are lots of places to stop off at on this first station – various cafes and eateries and souvenir shops to browse in. There’s also a swish cocktail bar and restaurant here that would be a fantastic place to visit at sunset with its views over the city: try one of ubiquitous (and very, very strong!) caipirinhas that you can develop a taste for in Rio. When you’re ready you can get in line to take the cable car to the higher section of Sugarloaf Mountain. This second leg is equally quick, but the ascent becomes much steeper as you approach the actual mountain. But this just means that you are presented with even more stunning and wide reaching views once you reach the top. There’s also a terrace here, smaller and bit windier than that on the hill below, but big enough to make it worth spending a bit of time here and savouring your chance to experience one of the world’s greatest tourist attractions. When we eventually took the cable car back down the mountain, we took our final opportunity to take in the amazing city that is Rio. I was amazed (and quite proud!) that I’d actually managed to do this trip and would recommend it to anyone, even those with a fear of heights or who are not fans of cable cars. I was told before I went that I’d find it hard to think of many views that are better than this one, and that’s so true: give it a go – you won’t regret it. – Other things to see and do: There are so many things to do in Rio that if you’re on a short trip, you’ll need to be selective. We chose to visit the Christ the Redeemer statue, taking the cog train upwards through the Tijuca forest to the top of the 2,300 foot high Corcovado Mountain – reaching it this way makes the journey almost as memorable as the final destination (I say almost because the sight of the 38 metre statute when you reach the summit is hard to beat, especially when you realise that you have a panoramic view of the Guanabara bay and you are overlooking the famous Sugarloaf mountain that juts out into this bay). On a separate day, we took an old fashioned and antiquated tram on a winding – and at times slightly bone-shaking journey – to the quaint and bohemian neighbourhood of Santa Teresa. This is a lovely area for lunch and there are plenty of small artisan shops lining the small cobbled streets to browse amongst and buy your souvenirs from. A walk around the old colonial centre near the central business district also took us past the beautifully grand Municipal Theatre, past the Metropolitan Cathedral of Rio de Janeiro (probably one of the most interesting and unusual cathedrals I’ve ever visited, having a Mayan like appearance from the outside and modern stained glass windows on the inside) to the bright and brilliant Selaron Steps. These steps are the work of Jorge Selaron and are decorated with brightly coloured mosaic tiles, some of which depict recent famous events – e.g the World Cup. There was then an afternoon spent chilling out by the beach. We loved the wide, open, beaches of Copacabana and Ipanema and in the evening, the atmosphere here is both laid-back and relaxed, but with a partyish feeling. However, we were regularly told not to actually walk on the beach at night for safety reasons so this is probably good advice to heed. 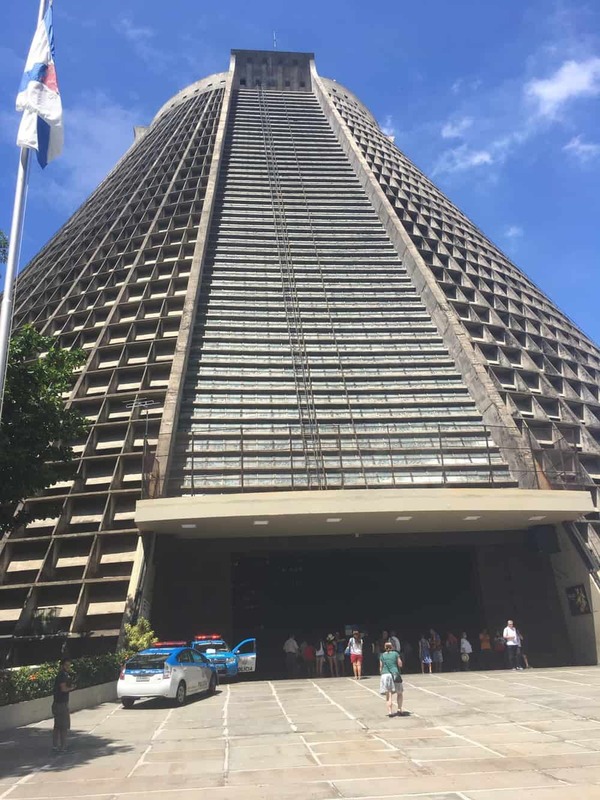 If you can book ahead to visit the main sights – in particular the Christ the Redeemer Statue and Sugarloaf Mountain – then this would be worth it to avoid the queues, particularly in high season. The cog train to the Christ the Redeemer statue starts at Corcovado train station and runs every 20 minutes throughout the day. To take the cable cars up Sugarloaf Mountain, you can buy tickets on the concourse at Praia Vermelha. – Travel information: There are direct flights to Rio from Europe, South America and the United States (flights are indirect from Australia). The international airport is a fair way out of the centre, so I would suggest taking a taxi if you can afford this; however, check whether your hotel offers a free transfer (ours did, but we discovered this too late to book) or whether there are any good deals to be had by booking both your in and outward bound taxi journeys at the same time.